Just in time for the holidays, Joan of Arc joins Saint Therese Lisieux in the Dolls From Heaven Collection. 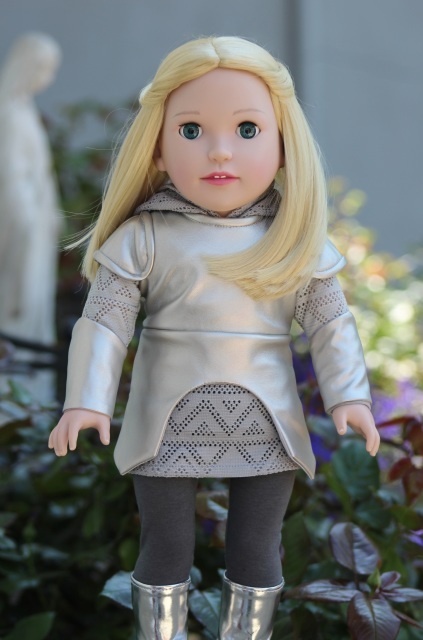 Presenting the Catholic answer to American Girl dolls, each 18″ saint has her own storybook and accessories, which can also be ordered separately. These dolls are a great way to help teach your children, godchildren and grandchildren Catholic values and immerse them in Catholic culture. Flaxen-haired Joan comes ready for battle, dressed in armor. What a role model for young girls today, who must fight to maintain their dignity and self-respect in a hedonistic culture. Joan’s commitment to the Sacraments, clean language, and decent living is refreshing in today’s culture of pleasure, foul language, and self-importance. Joan’s cape, flag, medal and prayer card are also available. She also has a cloth body and moveable vinyl head and limbs. Parts of Joan’s story appear on the Dolls From Heaven blog. So do parts of Saint Therese’s. We study the saints to learn how and become inspired to live better lives. What a fantastic tool to help not only our children but ourselves, to become stronger and more faithful Catholics. Dolls From Heaven is a Catholic mom and pop business. Although most of the doll itself is outsourced, some of the product is manufactured by the Kiczek family, themselves. They are avid participants in the pro-life movement and practicing Catholics. You can read more about them and what inspired them to create Dolls From Heaven on their website. Dolls From Heaven are special gifts. With Christmas coming up, now is the ideal time to order yours. Don’t forget Baptisms, First Communions, Confirmations, and Birthdays. The author received no compensation for this review.